My green machine: has room and power, and functionality. I love that it is a truck, but the gas mileage stinks. 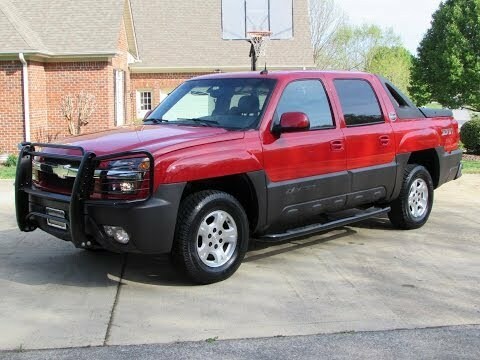 It is a 2003 Chevrolet avalanche. It is my first truck. The performance is good, but I wish the Chevrolet brand had a better gas mileage. It is a reliable truck and will never get rid of it. The avalanche has a corvette engine, which is cool. I guest I rather be in truck than a small, low to the ground vehicle. My trucks back seat can fold down like an SUV. My vehicle functions well overall, but once in awhile it breaks down from certain engine problems and sometimes the backlight falls out. Also as a handyman I like space in my truck and the little compartments in the back and the sides make it so I cannot fit an small sized truck toolbox in the back or a lumber rack on the top which is very disappointing. Big red. It is always gotten us from point A to point B.
I love my truck. We call him big red. We've had since my daughter was born in 2011 and wouldn't trade him for the world. Seats are the best, almost like a recliner. And 4 wheel drive is a plus for this truck. Many beach trips and some off-road attempts. Never had any major problems out if it. Normal maintenances. But overall a great truck! On certain pickup trucks and sport utility vehicles, the galvanized steel tailgate support cables that retain the tailgate in the full open (horizontal) position may corrode, weaken, and eventually fracture. If both cables fractured, the tailgate would suddenly drop and strike the top surface of the rear bumper. Anyone sitting or standing on the horizontal surface of the tailgate when both cables fractured could be injured by falling from the tailgate. On vehicles that have had the bumper removed, the tailgate may drop even lower. Additionally, if there is cargo on the tailgate the cargo may fall off if the support cables fracture. Dealers will replace the cables. The manufacturer has reported that owner notification is expected to begin during the third quarter of 2004. Owners may contact Chevrolet at 1-800-630-2438; Cadillac at 1-866-982-2339; or GMC at 1-866-996-9463. On certain sport utility vehicles, during a 30 degree left angle frontal impact of sufficient severity, a tear could develop in the mid-frame cross member at its attachment to the left frame rail. If the mid-frame cross member tears during frontal impact and produces a sharp edge, contact of the sharp edge with the fuel tank could result in a puncture of the fuel tank and possible fuel leakage. Fuel leakage, in the presence of an ignition source, could result in a fire. Dealers will install a fuel tank shield. The manufacturer has reported that owner notification is expected to begin during February 2003. Owners may contact Chevrolet at 1-800-222-1020, or GMC at 1-800-462-8782. Certain sport utility vehicles, pickup trucks, and passenger vans fail to comply with the requirements of Federal Motor Vehicle Safety Standard No. 135, "Passenger Car Brake Systems." Some of these vehicles were produced with an out-of-specification brake hydro-boost housing relief valve bore. Consequently, the valve O-ring seal may fracture. Steering efforts may be slightly increased while braking or parking. Under certain driving conditions, a fractured seal may also require an increase in the applied brake pedal effort to achieve the same vehicle deceleration. Dealers are to replace the hydro-boost relief valve. The manufacturer has reported that owner notification is expected to begin during the second quarter of 2004. Owners may contact Cadillac at 1-866-982-2339; Chevrolet at 1-800-630-2438; GMC at 1-866-996-9463; or Hummer at 1-866-486-6376.